Artist's reconstruction of the Spring Tower and Water Gate. The impressive Spring Tower protected not only the entrance to the city (the Water Gate), but the Rock-Cut Pool, and the Gihon Spring as well. 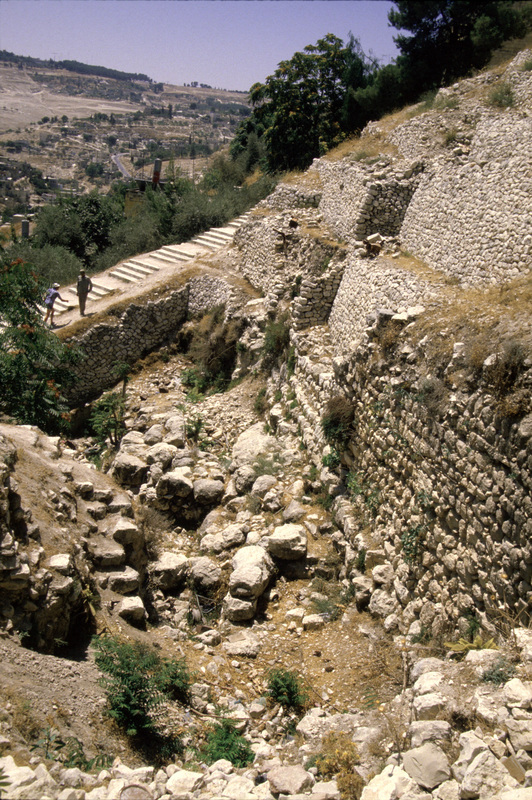 The Mid-Slope Wall ran from north to south along the eastern ridge in the City of David, and at the time of its construction, a castle or palace existed on top of the ridge, just north, of the gate. The "mind of the Spirit" would dictate that this is the location of the Water Gate mentioned in Nehemiah 3:26, situated between the Fountain Gate (Nehemiah 3:15,) and the Horse Gate (Nehemiah 3:28). But "man's wisdom" has led archaeologists to a different conclusion. Entrance to Bronze Age passageway leading to the gate in the mid-slope wall, higher up the slope. Rock-cut Pool is on the left, below the balcony. When it comes to the science of archaeology, things often get turned upside down. Benjamin and Eilat Mazar discovered the Horse Gate, but it has been labeled the "Water Gate." Ronny Reich and Eli Shukron discovered a large section of the Water Gate, but they decided to call it, the "Pool Tower." The names and locations of the ancient gates should not be difficult to figure out because the name and location of each gate is precisely identified by Nehemiah as he describes the repair of the wall and gates. Nehemiah 3:13 mentions the Valley Gate. The location of this gate is well known at the southwestern corner of the city. By moving counter-clockwise, we then find the Dung Gate at the southeastern corner of the city (verse 14). Next comes the Fountain Gate (verse 15) near the Siloam Pool. There are no gates mentioned as we move northward, between the "sepulchres of David," and the "tower which lieth out from the king's high house, that was by the court of the prison." But the Water Gate does finally appear in verse 26. The Horse Gate comes next (verse 28) with its four-chambered gate, and associated tower, which was constructed using Phoenician ashlars in the header-and-stretcher style. We then come to the East Gate. Its location is also well known in the eastern wall of the Temple Mount. This same order of the gates is given in chapter 12 of Nehemiah (verses 31-37) where he describes the route (Valley Gate, Dung Gate, Fountain Gate, Water Gate) taken by the celebrants on top of the wall. It was at the Water Gate (chapter 8:1-3) where the people of Jerusalem experienced a great revival (Nehemiah 8:1-3). After Ezra read the Law to the people, the Bible says: “And all the people went their way to eat, and to drink, and to send portions, and to make great mirth, because they had understood the words that were declared unto them" (Nehemiah 8:12). Eilat Mazar calls the Horse Gate the Water Gate, but her grandfather, Benjamin Mazar, correctly identified the gate above the Gihon Spring as the Water Gate: “In any case, there are traces in the Gihon spring area of the line of wall belonging to various periods in the second millennium and the first half of the first millennium B.C. It is in this area, too, that we should locate the Water Gate, an important gate in the eastern wall since earliest times. The name shows that it must have led to the Gihon spring in the Kidron valley" (The Mountain of the Lord, Benjamin Mazar, p. 175). Having made the case that this gate, by the Gihon spring, is probably the Water Gate, we must now return to the gate discovered by Eilat and Benjamin Mazar, and find its correct name. In Nehemiah chapter 3, we find that the gate, situated between the Water Gate (verse 26) and the East Gate (verse 29), is the Horse Gate (verse 28). That is the proper name for the four-chambered gate discovered by Eilat and Benjamin Mazar. We would like to thank the archaeologists for their exhaustive work in excavating the Ophel and City of David areas, and sincerely trust that they will eventually give the proper names to their discoveries. Evidence of the Water Gate? This Bronze Age corner jutting out from the mid-slope wall above the Gihon spring may be associated with the Water Gate. Notice the cobblestone walkway before its removal. 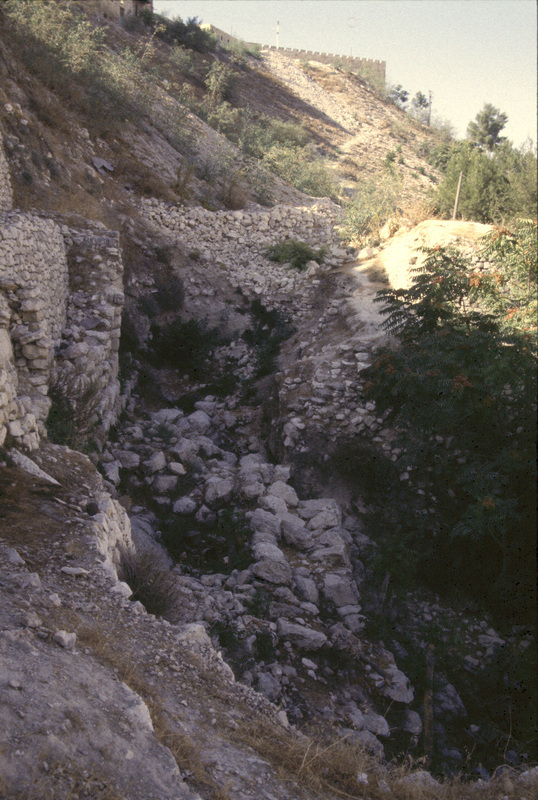 This section of wall runs westward up the slope, with Hezekiah's mid-slope wall (which can be seen in the upper-right corner of the photo) running right over it. 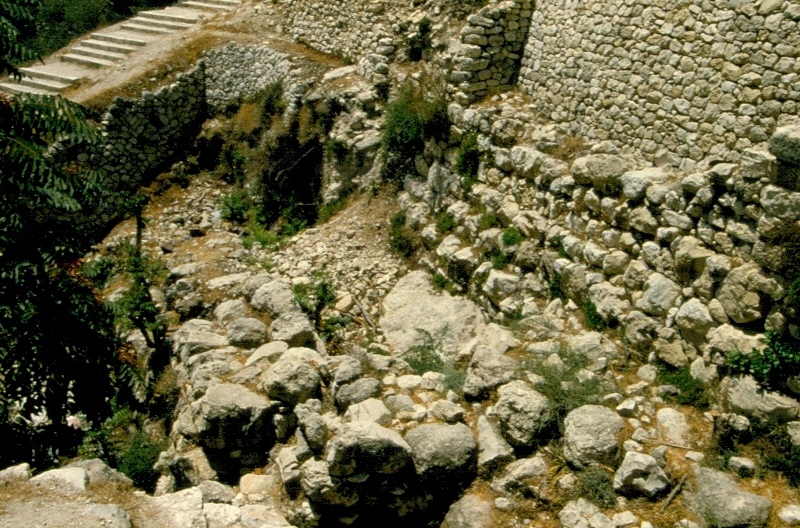 The Gihon spring is located below the building with the double-arched windows at the bottom left. The Water Gate would have been located behind and to the left of the building at center (Photo by A. Chrysler). Large boulders of Bronze Age corner attached to the mid-slope wall above the Gihon spring. 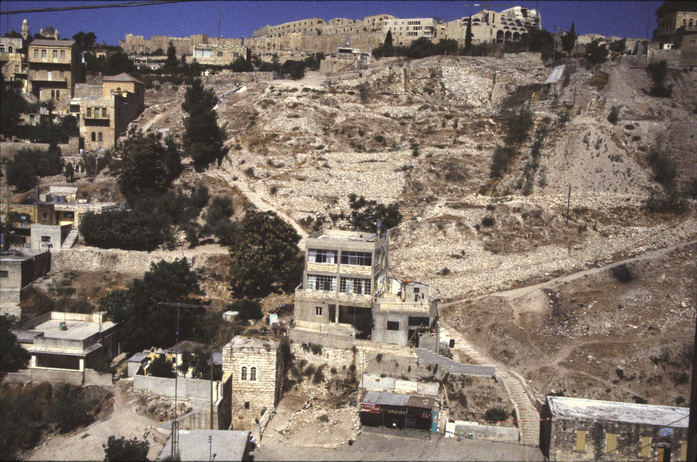 The southern wall of the Temple Mount is visible in the distance to the north (Photo by A. Chrysler). Large boulders of Bronze Age corner running under Hezekiah's mid-slope wall above the Gihon spring (Photo by A. Chrysler). Boulders form corner that is associated with the mid-slope wall above the Gihon spring. The ancient passageway recently discovered by Reich and Shukron runs up the slope here under the stairway to the south in this picture (Photo by A. Chrysler).